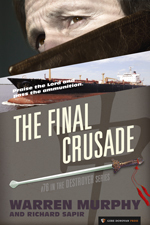 A greedy televangelist has started an unholy war against Middle Eastern powers, using his crusade for a religious relic as an excuse. The Iranians have responded with terror attacks that threaten the Unites States. CURE must intervene, but keep a low profile. An Ayatollah, oil company, and fanatics all make a deadly and not so politically correct mix, as Chiun must convince Remo that Sinanju still has all the answers—and power.